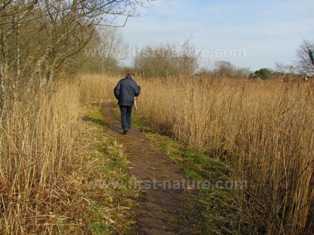 This nature reserve has a wonderful beach, but if you take a short walk inland through the sand dunes and along the boardwalk in the marshy areas it is like entering a different world. In summer many kinds of chalk-loving wildflowers bloom there, and the air is alive with birdsong and the buzzing of the insects that make there home at Oxwich NNR. 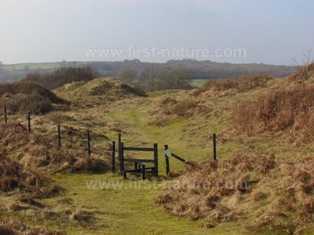 Oxwich NNR is managed by Natural Resources Wales (NRW). From Swansea take the A4118 Gower road towards Killay, Parkmill and continue through Nicholaston. There is a privately run car park for Oxwich directly off this road a short distance from Nicholaston. There is a charge for parking a car at the reserve. 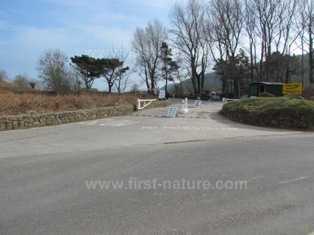 Most of this nature reserve is open access, but there are a few areas where, in order to protect the wildlife, groups can visit by special arrangement only. 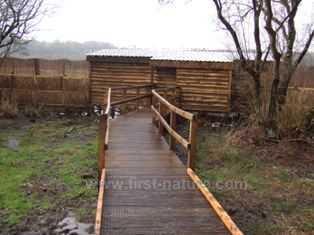 There are well-defined paths throughout the reserve and an extensive boardwalk that runs through the marsh and reedbeds. There are stiles and gates throughout and so it is not suitable for wheelchair users or for people with prams or pushchairs. There is a public toilet block in the car park but it is not always open, and there is also a privately operated café immediately opposite the car park entrance. There are also information boards in the reserve. Oxwich NNR is a great place to see wild orchids in late May and June. 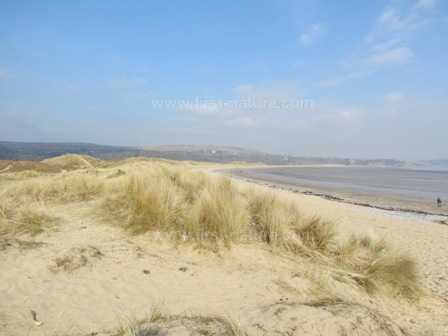 Like other coastal nature reserves in Wales, Oxwich has a high chalk content in its substrate because of the crushed shells in the sand which is blown inland from the bay. This means that many chalk-loving wild orchids and other wildflowers can be seen in relatively small areas. Orchids found at Oxwich include the Bee Orchid (Ophrys apifera), Common Twayblade (Neottia ovata), Early Marsh-orchid (Dactylorhiza incarnata), Southern Marsh-orchid (Dactylorhiza praetermissa) and Pyramidal Orchid (Anacamptis pyramidalis). Between the nature reserve and the surrounding ash woodlands more than 600 species of plants have been recorded at Oxwich. The birdlife at Oxwich is impressive, too, and rare visitors include Cetti's Warblers (Cettia cetti) and Sedge Warblers (Acrocephalus schoenobaenus). Recently, a Bittern (Botaurus stellaris) was recorded there after an absence of many years. The freshwater lakes provide overwintering habitat for wildfowl which inclue Teal (Anas crecca) and Gadwalls (Anas strepera). The wealth of wildflowers at the nature reserve means that many kinds of invertebrates are also able to live there. Rare insect species include Cepero's Groundhopper (Tetrix ceperoi), and the Strandline Beetle (Nebria complanata) - also known as the Beachcomber Beetle. Tidy beaches don't suit this large invertebrate, which requires driftwood under which it shelters and can find its favourite snack of sandhoppers to feed on. Cepero's Groundhopper is also mainly recorded from coastal habitats in the UK including sand dunes like those found at Oxwich; it fees on moss, lichen and algae. Another rare insect of the marshy area at Oxwich is the Hairy Dragonfly (Brachytron pratense). This dragonfly is named because of its hairy thorax, which sets it apart from other similar species. It hunts across water and feeds on smaller insects, which it carries off to a perch and then devours. While you are in the Oxwich area it is well worth a walk through some of the adjacent woodlands, which are protected as part of the Gower Ash Woodlands SAC because of their special habitats and wildlife species. Apart from the woodland within Oxwich National Nature Reserve, The Forestry Commission has a site 800m (1/2 mile) from Parkmill called Parkwood, which is typical of the woodlands that lie all along the coast behind Three Cliffs Bay and Oxwich Bay. These woods have a spectacular display of wildflowers in the spring, such as Bluebells (Hyacynthoides non-scripta) and Ramsons (Allium ursinum). They also have some rare plant species. Purple Gromwell (Lithospermum purpureocaeruleum), Herb Paris (Paris quadrifolia) and Butcher's Broom (Ruscus aculeatus). Butcher's Broom also has another much more descriptive common name - Knee Holly - and if you happen to walk through a colony of these plants the reason for the name becomes imediately obvious! Throughout Wales there are many woodlands that are significant for their bat populations, and Gower Ash Woodlands is no exception: both the Lesser Horseshoe Bat (Rhinolophus hipposideros) and the Greater Horseshoe Bat (Rhinolophus ferrumequinum), among others, use the woods and rocky cliffs in the vicinity to roost and to raise their young. The freshwater lakes and humid atmosphere of the woods make them ideal places for the bats to find the small insects upon which they feed.